I dont know how it happened but over the Christmas break and despite all the bad food and lack of training I lost the last few kilos that were bugging me Perhaps I lost some muscle tone but at this point I really dont care, I finally weigh what I have been aiming to weigh for over a year - I am stoked!! As my ticker states I started at 86kgs and I now weigh 65kgs, which means I lost 24.4% of me - that still blows my mind!! I have gone from a tight fitting size 18 to a loose size 12! Why dont you post a piccie so we can see how skinny you are now!!! Congratulations. You should be very proud of your achievement. Particularly so because you did it over a very tough time of year. Thanks all!! It really surprised me that I managed to lose weight rather than gain it over Christmas I will definetly post pics as soon as I find some good ones, I think there are some good recent ones but they are all at home! Well done! What a fantastic effort! Yay, WELL DONE Masm that is fantastic news! Good on you and over this time of the year it is a special achievement. If you want to stick around come join the maintenance crew, the more the merrier! I'll say...congrats Masm....superb effort!! 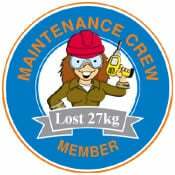 I hope you hang around to join the maintainence crew and share you story with us!! Look forward to the pics!! CONGRATULATIONS!!!!! that is a fabulous effort good on you i bet your walking on air? well done on achieving your goal weight masm!!! Well as promised here are some pics. Wow Masm you look terrific!!! Congratulations!! It is not just the roll of fat gone.....you can see the difference everywhere!! Well done mate! wow you look so fit and healthy and happy! yay!